The following text is a conversation about Liquid Properties, a project in two parts: a nature fiction film entitled Reclaiming Vision and the installation of glass sculptures at the site of the outdoor screening, containing water samples taken from along the Oslo Fjord. The conversation between Marjolijn Dijkman (Brussels), Toril Johannessen (Tromsø) and Karolin Tampere (Lofoten) took place on Skype in late June 2018. Karolin Tampere In the project description you sent me, you say that you in this work want to be “lifting up the water, visuals on a micro scale – and bring a narrative on a macro scale”. Could you start with telling me a bit more about this notion of “lifting up”? Toril Johannessen First of all, we both have an interest in how nature is mediated and what kind of relationships this evokes, for instance, through changing scientific paradigms. The idea of “lifting up” also comes from thinking about the area of Bjørvika, the new neighbourhood of the Munch Museum. If you look at the surface, you will see banking, businesses, cultural institutions, new residential areas, glass and steel, a strong economy, all of it developed according to a strict plan and, partly, on reclaimed land. You will also see a relationship to the sea that has changed in recent years. Similar to other harbour development projects, Oslo has implemented a city plan – Fjordbyen, or the Fjord City – in order to open up the harbour for its inhabitants and visitors. By moving activities such as shipyards and container ports, the area is opened up for recreational activities, and so the harbour is perhaps less about access to the sea, and more about access to the shore. So, we had been walking the streets and paths of Bjørvika numerous times, watching the new borough grow with the fjord as a backdrop. We were interested in how we relate to the shore and to the water itself, and decided that, instead of looking at social life on land, we would rather have a look at what is going on beneath the surface. KT Yes, I would like to add that the motto for Oslo is “the blue and the green – the city in between”, which actually sums up what you just mentioned in terms of the transformation of former industrial harbour cities, partly aimed at creating “more attraction and living qualities” where focus is set towards physical access to coastal zones. Another potential impetus could be connected to investment-related interests such as a booming real estate market. So, “lifting up” these invisible agents and actually already existing inhabitants of Bjørvika, alongside new protagonists of a neighbourhood-in-the-making gives an idea of what kind of life exists there already. Some of these guys (the microorganisms) have been around on our planet longer than any of us. They are embedded in our life, on the outside and on the inside of our bodies and surroundings, inhabiting us with their own ecosystems. Marjolijn Dijkman Yes, true, every second breath we take is produced by algae in the oceans – quite incredible! Another aspect we have been looking into is the traces of human activities in the area that can be found in the water itself and in the sediments of the fjord and the river. By going beneath the surface, you’ll find that the environment there is still affected by activities that happened in the past. You may reallocate, for instance, harbour activities from the city, out of sight, but all the historical traces of the pollution and remnants are still there in the waterbed. That is another way of lifting up and investigating what went on there, in the past. At most places along the river, including where our project is presented by the mouth of the Aker River (Akerselva), you’re not allowed to stir up the silt because of the pollution sedimented there. TJ The seabed in Bjørvika is, in fact, an underwater desert. Artist Elin Tanding Sørensen points this out in an interview about the PhD project she is doing at the Norwegian University of Life Sciences on the underwater landscape of Bjørvika. She argues that access to the fjord only occurs at a visual level rather than a physical one, since there are only a few places along the shore where one can actually touch the water. In most places, the surface is two meters below the dock. This reminds me of the reflections we also made while walking in Bjørvika that everything there was made into an image. The architecture looks tailored-made for brochure photographs; the fjord becomes a painting. Akerselva was formerly used as a sewage system and a waste dump for the industries along the river, and could, at times, be seen in different colours from dyes from the textile factories. Residues of industry are still there, together with archaeological discoveries, such as heaps of chalk pipes, timber and sunken ships. The film is “micro site-specific” in the sense that Akerselva and Bjørvika provide the organic and historical source material. Nonetheless, the narrative is on a larger scale, concerning other places and global phenomena as well. KT This is where I would like to jump in and point out your highlighting of brackish water. It is, in fact, at this meeting point of the river and the sea that your work is presented in Bjørvika. MD Yes, brackish water is on the rise around the world due to the ocean levels being affected by global warming and melting ice caps. Brackish water is a critical local and global phenomenon, so, therefore, we have also been looking at the new location of the Munch Museum, where the river meets the fjord, within this kind of macro scenario of rising brackish water around the world. TJ We were, in fact, interested in the notion of the brackish since before deciding to make a film. “Brackish” is somehow such a muddy metaphor in itself. What it brings to mind is usually something murky and dirty, hostile to life, not good, can’t drink it, wouldn’t swim there. Yet, for some, brackish is considered a metaphor for balance. So, we discussed whether it would be possible to look at the brackish in a positive light; whether the alleged impurity of the brackish and its perceived low status could mean something else. KT Could you give an example of where brackish is a metaphor for balance? MD For the indigenous Yolŋu people of northern Australia, for instance, brackish water is a source of inspiration. In each of the sources of flowing water there is movement in a complex, dynamic balance. These different types waters coming together imply an interaction of different personalities in their ebb and flow. And this kind of conjunction of personalities is also used as a metaphor for constellations of groups, kinship relations or society at large. KT One could also look at it as a zone of transformation, where different species and traces of ongoing human activity and its history still exist, like temporary liquid archives. You mentioned the ice caps and it got me thinking about when I first encountered the day-to-day research of different micro-biologists located in Svalbard. They are very eager to monitor and study the organisms that are released from their solid state – the frozen archives – and, for brief moments collected in puddles. It is crucial to secure information from these before the organisms run away with the water towards the fjord. Once this happens, the potentially never-ever- seen-before microorganisms disappear into the ocean. Looking for unknown answers to our life on earth is often expressed as an ongoing driving force behind this meticulous research. So, just before the glacier ice from the mountains transforms into brackish water – the “murky and dirty” – it is potentially in its “purest state”, inhabiting information to decode and “reveal” the mysteries of life. MD Yes, that is a very intriguing process. “Liquid archives” – that sounds great! Besides the evolution of life, which fascinates us, of course, we have also been thinking about the evolution of civilizations. Specifically, how civilizations often evolved around brackish waters because it was a strategic place to settle down. These particular spots, where rivers and oceans meet, combine the best of both worlds, somehow. So, because a lot of cities are built around these kinds of estuaries, there are a number of traces of the effects of culture on nature in these types of waters. TJ Many civilizations were built next to rivers and seas, but, as Henrik Treimo, one of the researchers we spoke to in the process, made us aware of, if you shift the perspective a bit, you could say that civilizations were, in fact, built around brackish water. MD Like Oslo – and now civilization is stimulating the rise of brackish waters through the effects of global warming, potentially becoming a threat to itself and to all life. Another thing we have been looking at, relating to the title of the film, is this idea of the evolution of vision. 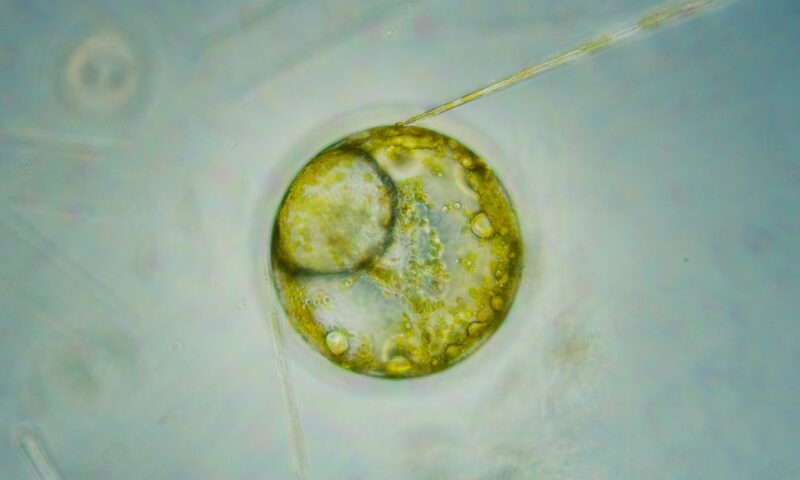 The microscope is a very advanced form of vision and these ancient algae we have been observing, like the Euglena, developed the earliest eyespots a few million years ago. So, there are several types of evolution that interest us, including the evolution of life, of vision and of civilization. When we look through the microscope, what do we really see? This sort of enhanced technological vision and the microscope itself are important features of the film. KT The microscope is listed in the credits alongside all the other invisible-to-the-human eyeprotagonists in this film. Could you tell me a bit more about the featured Euglena algae? TJ The Euglena featured in the film are from an algae culture kept at the Section for Aquatic Biology and Toxicology at the University of Oslo. It is a genus with many different species, some living in fresh water and some in salt water. Euglenas are very popular organisms for study; they are used as model organisms to understand a wide range of biological phenomena, for instance, the perception of light. They have features of both plant and animal, so they did not fit into older taxonomic systems; they were unclassifiable. Formerly, they belonged to the now obsolete kingdom Protista, but they are now classified as Excavata, a new category introduced in 2002. KT Moving on from the background, the context of the site and the connections you have made there, let’s talk about your process in working with this living material. TJ Actually, when we started drafting this idea, we first thought about doing a “lab set-up”, literally lifting up the water and showing it live. But, then we realized that it would be hard to achieve something that could work visually the way we wanted it and create a closer relationship to these microorganisms. We wanted to see whether it was possible to feel empathy or closer to something that for most, and for us as well, is so abstract on a microscopic scale. So, we figured that we needed to use cinematic strategies, but that would be difficult with the “lab on-site” approach. KT What was most challenging in your process before reaching this final result presented to us? TJ Many things, including the fact that we did not know that much about film production. There was a lot of “learning by doing” in this process, which just had to be that way, I guess, because we did not know exactly how the microscope worked, how we could use it, what kind of organisms we would find or what kinds of effect we could create. We just had to explore the possibilities. We also wanted to create the script through getting to know what was there; we could not script anything very detailed before we knew what it looked like or what the potential of the material could be. KT As we are now moving into talking about the actual script, perhaps you could elaborate on the three chapters or parts of the narrative? TJ The first part shows a shift from diversity to monoculture. It starts off with a lush environment, which is actually algae, scraped off rocks on the shores of Bjørvika. The temperament is restless, as if searching or chasing through a jungle or unknown territory, then gradually moves into scenes with monocultures that finally give the impression of extreme overpopulation. We took our samples in Bjørvika and a bit further out in the Oslo Fjord, but we have also been working with the algae cultures at the University of Oslo. The University cultivates algae and keeps an extensive collection. The cultivated microorganisms in the film are commonly found in the Oslo Fjord and in ponds in the area, but these ones have been nurtured in the laboratory. These organisms never saw the ocean or the river. TJ Yes, and many are strains from generations kept in the lab. Some of the algae featured in the film can be toxic, such as Alexandrium, Prymnesium and Dinophysis, names that might be familiar as they sometimes cause harmful blooms and hit the newspaper headlines. Luka Supraha, one of the researchers who advised us in the lab, told us that about algae strains in the collection from famous blooms, so there are some celebrities in there. KT Could you elaborate on this bloom? TJ The particular example Luka mentioned was from a harmful bloom of Prymnesium polylepsis on the west coast of Norway. The first bloom was recorded in 1989 and then occurred in subsequent years, having a devastating effect on fish populations and, particularly the fish farming industry. Algae blooms can be caused by rising sea temperatures, as well as by run-off from farming and other industries. Again, human activity is a major factor. KT This information really adds another layer to the seductive and mesmerizing imagery we get to “dive into” in your film. TJ For sure, we were motivated by the importance of marine life, for instance, by how vision evolved, the toxic blooms, and how marine microorganisms are responsible for 75% of the oxygen production on the planet. In the second chapter, the microscope and laboratory equipment take on the lead roles, showing grids, numbers and petri dishes, where you realize that the organisms are, in fact, trapped. There is less sign of life in this part of the film, with scenes where we we dried some of the samples of salt water and brackish water, observing them crystallizing and dissolving. In the last chapter, we wanted to create a feeling of being in a different space, maybe even outer space. Here, we added other types of materials, such as ink and pigments, which evoke the history of the river with the dyes from the textile factories in Oslo. We also added oil, something which sadly became more topical than we had imagined by the recent oil spill in the Alna River. KT Yes, 50.000 litres of heating oil leaked into the river and out into the Oslo Fjord in May this year, which also closed off nearby beaches during a particularly hot month. I think it made people in Norway realize that its oil industry – even though this was a “small” leakage – could have disastrous consequences on fragile ecosystems. MD Indeed. In this third chapter there is also a part where we added microplastics. I joined a scientific research team mapping pollution across the Atlantic Ocean in 2010, and some of these pieces were sampled thousands of miles away from the shores. You can see that they are quite worn-out plastic parts, from fishing nets or other kinds of leftovers that end up in the seas and have been drifting there for quite some time. They feature in this third part of the film, which depicts a much more altered and affected ecosystem. There are a lot of resurrections, where things are constantly coming back to life and are adjusting to new kinds of situations in somehow altered states of being. The third chapter is, in that sense, very much about this human interaction with the natural world, where we leave traces invisible to the naked human eye, and nature’s resilience to these. KT Another important element that we should bring into this conversation is the amazing sound composition, which accompanies the images in this film. I am eager to know how you have been collaborating with the composer, Henry Vega. How did you work with the sound material he gave you? Perhaps you could reveal some of the cues, if any, you gave him during the development of the film? MD We have been in contact with Henry from the beginning, when we first started to imagine the film. He is an American-Colombian composer living in The Hague in The Netherlands. When we contacted him, he described his music as “micro-minimal” which is a nice match with our microscopic interest. He uses a lot of generated electronic sounds and acoustic instruments, such as strings or vocals. We approached him for a composition specially made for the film that we imagined could go hand in hand with the footage. These two elements, the film and the music, have been developed alongside of each other, in constant dialogue. In the beginning, we were sending Henry clips and script outlines, ideas for different temperaments within the script, as well as conceptual ideas about the narrative that we wanted to construct. He sent us sketches, which we used while filming and working with mock-up edits of the film. We have also been testing these together in a session at my studio here in Brussels. So, it is a very detailed collaboration, in fact, as detailed as split seconds in timing everything together. KT There is an element of surprise when the human voice appears, it sounds like she is singing in Latin – is it the names of the different life forms? TJ Those are names from the different kingdoms in taxonomic ranking systems. Some refer to older categories, like the “animalculae”, which was the name that Antonie van Leeuwenhoek, who invented the microscope, gave to what he saw under the microscope for the first time – resembling “animal molecules”. In the manuscript for the vocals there are also new invented kingdoms, such as “protoplastics” and other forms of nature-culture hybrids. KT I think the text adds and highlights this nature / culture dichotomy. TJ From early on, we knew we did not want to use a human narrator, but, somehow, we took for granted that the film would have a text. So, for a long time we were working with the idea of using some text, in the form of subtitles or intertitles between the chapters. At quite a late point, though, we decided to leave that out, in order to let our visual essay be exactly that – visual. Text narration would add a very different tone. Still, there is a lot of human intervention and interaction in the visuals, with the pipette and the microscope itself, the grids and the pollutants, so the voice highlights that humans are very present on several levels. KT I noticed that the images are edited so precisely alongside and merged with the sound composition; it is not over-dramatized, which perhaps could be tempting to do because of the potential in this curious imagery. You know, like in nature documentaries, when something is moving, suddenly disappears, drastically changes colour or shape there is often a “thriller-like” soundtrack to it, often portraying a hunter and its victim. I know you have been aware of this and previously discussed the implications of this form of presenting facts through creating narratives based in formats used more in fiction movies. When I watched Reclaiming Vision, I got to thinking about one of the first known people to makenature documentaries. It was the French biologist-turned-filmmaker Jean Painlevé. He captured and mediated life under water as part of his pedagogical interest in wanting to share this magical unknown to a larger audience. He is best known for his film The Seahorse (1934) that became a hit in French cinemas and among the Surrealists, who, in fact, had been an early inspiration for Painlevé. He allegedly made at least three versions of each film, in order to mediate the content to different audiences. Painlevé used musical soundtracks to great effect: The Love Life of the Octopus (1965), for example, was accompanied by an entrancing soundtrack from musique concrète composer Pierre Henry. TJ One of our early questions in planning the film were the levels of fact and fiction. Early on, we called it an “experimental nature documentary”. Then, we suggested “psychomarine ecology”, as a form of psychogeography for the sea: a way of looking for hidden structures and histories in the water. Now it feels apt to call it a “nature fiction film”, though many nature films have a high level of fictionalisation. MD To return to the idea of bringing the laboratory to the shore, which we spoke about earlier: we are, in fact, doing a version of this in an on-site installation, near the outdoor screening of the film. The installation consists of hand blown glass objects in a variety of shapes, containing water samples from along the fjord. We have been working with the Oslo-based glassblower Vidar Koksvik. Each object has lenses, created by a dipping technique that makes parts of the glass thicker. KT So, you will actually still be “lifting up” the water into glass objects, designed to also act as magnifying lenses, then? MD Yes, we will have the possibility to physically lift up the water and engage with the material in the form of the water encased in glass. This will be presented next to the screening site, and will be available for the duration of the project, unlike the film which has specific screening times throughout September this year. KT What are the shapes informed by? TJ The shapes are partly informed by some of the organisms you can see in the film, like the Euglenas, the shapeshifting, dancing ones. The idea is that the sculptures, when assembled, will act both as functional viewing devices and as closed ecosystems, magnifying each other. In that sense, they are water-based lenses and ecospheres at the same time. As with the film, our approach to the glass sculptures has been experimental, perhaps more so than previously in our separate practices. MD And because we will sample the water from different places in the river and the fjord, the colour of the water, as well as the content, will be slightly different in each glass sculpture. They will all contain a closed sample of the river that is featured in the film, and which flows between the audience and the screen while they are watching it. TJ Looking at the water up close – in the film and the sculptures to a lesser degree – one could say that life and death are magnified. It is a condensed view of the community under the surface. We have made a trillion images to create this film, but our aim was still to see if we could evoke a relationship, evoke empathy with organisms and processes that are normally out of reach – both visually and emotionally. Karolin Tampere (NO) is an artist and curator based in Lofoten. Currently she is engaged as a curator at the North Norwegian Art Centre in Svolvær, and has a particular interest in collaborative practices. Since 2004 she has regularly contributed to the “forever lasting” art project Sørfinnset Skole/the nord land, and together with Åse Løvgren she initiated the ongoing collaboration Rakett in 2003. Tampere is part of Ensayos, a feminist research program through which artists, scientists and local agents contemplate and engage in matters related to the political ecology of Tierra del Fuego (CL). This interview was originally published in the booklet Liquid Properties – Marjolijn Dijkman & Toril Johannessen, edited by Natalie Hope O’Donnell, published by the Munch Museum for Munchmuseet on the Move (2018). The project Liquid Properties was commissioned by Munchmuseet on the Move, a four-year, off-site curatorial project of contemporary art, curated by Natalie Hope O’Donnell.